There are 15,873,213.5 iPad cases and stands, and dozens of iPad mounts. While that statement may not be completely accurate, it would be fair to say there are a lot. So what's with another review of the same old stuff? In a word, "System". 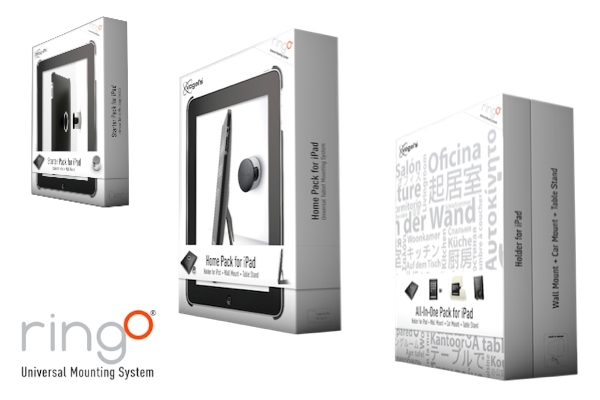 A complete and comprehensive eco-system of compatible cases, stands and mounts for tablets. And as far as I can see, there may only be a few tablet "Systems" in existence. 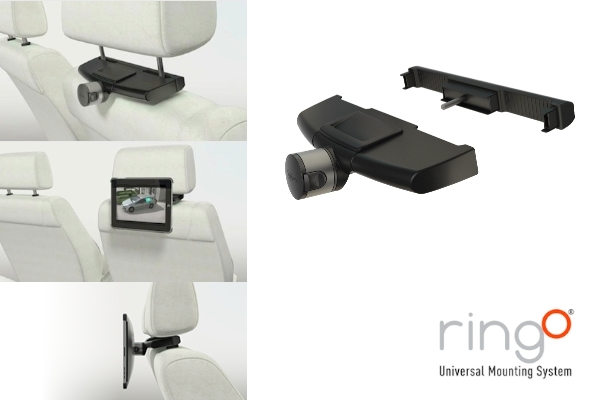 We're going to look at one - Vogel's RingO Universal Mounting System. Welcome to the Pros, my friend. Vogel's isn't new to mounts. They make mounts for flat screen televisions, projectors, audio/visual equipment and loudspeakers used all over the world in airports, living rooms and commercial buildings. This experience has led to an innovative mounting system encompassing cases, stands and mounts for just about any environment. 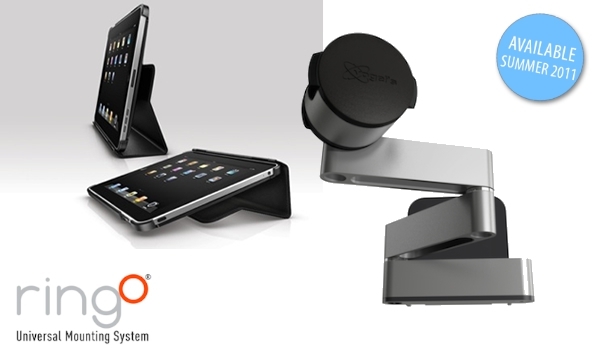 I was sent their All-In-One Pack (bundle) for the iPad, including a Wall Mount, Car Mount, and Table Stand. All of these items pair with their case, Vogel's "Holder", and can be easily taken from one environment to another with a quick release and a click. Let's take a look at how they work together to form a System. As with most cases, the Holder snaps onto the iPad and has a solid back and bezel-less front. 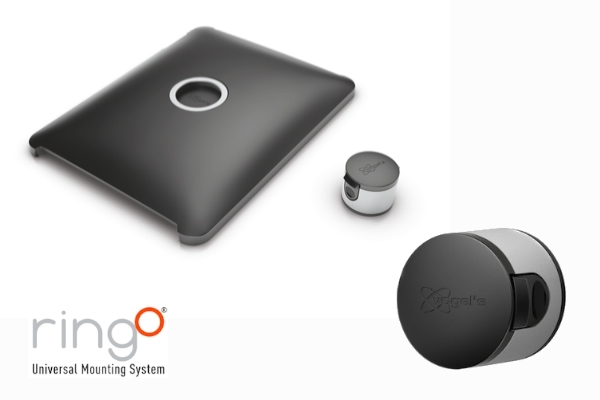 Because of the innovative aluminum ring (the Ring in RingO), the case is deeper than most, perhaps by ¼ inch - ½ inch. The plastic used is also thicker than most but, overall, the case has a significant, if not upper-scale, feel to it. The Holder curves in a healthy arc from the bezel to the ring. This curvature and the smooth plastic makes handling the Holder sometimes awkward and uneasy. Reaching around the case allows for a couple of fingers to grip the case via the ring but, while that is handy for carrying the iPad around, it's not very convenient or comfortable for in-hand iPad use. This slick little device mounts to almost any surface via a long screw. It is small, cylindrical, high-tech looking, and minimalistic in its design. The patent pending design employs two unidirectional tines to snap into the Holder's ring and tightly hold the iPad on a wall. To release the iPad, you simply press the two tines in while securely grasping the iPad. The mount is intended for use in every room of your house encouraging you to bring the iPad/Tablet with you wherever you are. At $30 apiece, I am not sure the plan is well thought out, but the intention is solid; as long you don't like holding the iPad in your hands. In the same vein as the Wall Mount, Vogel's car mount implores you to free your tablet from the confines of your home, and snap it into place in your vehicle. This mount is very cool! The two-piece tool-less design simply snaps around your first row seat head rests, allowing those in the second row to watch movies, play games or grab their email. The mount allows the iPad to be adjusted up and down helping to provide an optimal viewing angle. The Holder snaps onto the Car Mount just as it does the Wall Mount. Releasing the Holder is also the same - press in the two tines and securely grasp the Holder. It couldn't be quicker or more convenient to pop the iPad in and out of the car, or into a secure compartment away from prying eyes. It works, and works well. In my opinion it's the most compelling reason to purchase this system. While all pieces thus far have been made of high quality aluminum and plastic, the Table Stand looks like an afterthought on the grandest scale. This flimsy, oddly shaped piece of plastic snaps into the Holder ring like the Wall Mount, but sadly misses the high quality snap-feel and pleasing action. It is difficult to attach, and even more so to remove. This piece is going to break; if not by continually attaching and removing it, then by my hand in frustration of having to use this in amongst a great suite of compatible products! The stand has two legs - one long, one short, to allow for landscape and portrait displaying. Problem is, it holds the iPad at such a ridiculously upright angle that it keeps you guessing when it's going to fall forward on its face. And while they could have capitalized on the design to allow for a comfortable typing angle while on a flat surface, they delivered a stand that, when used that way, creates enough bounce to make your air-equipped low rider green with envy! Coming soon are the Flex Mount and Flip Stand. The Flex Mount is a three-piece articulating arm that expands out from the wall at accommodating distances and horizontal angles. I really want this piece for my kitchen but, sigh, it is not available until later this summer. 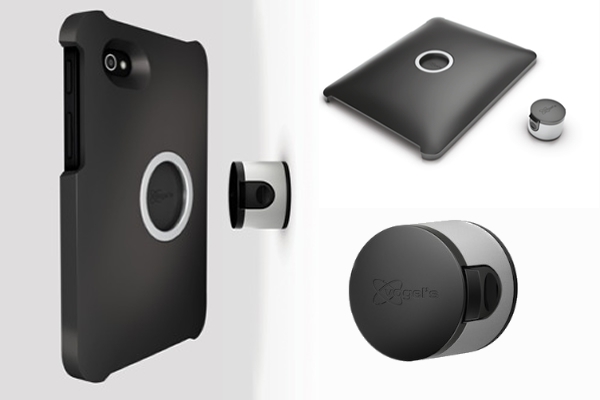 It utilizes the same mount as the Wall Mount and Car Mount, and snaps conveniently into the Holder. The Flip Stand is a smart cover that attaches to the Holder and provides protection for the iPad screen as well as a typing-angle solution for the iPad when it is folded behind the unit - as so many are today. What would a complete system be without a software component? (If you answered incomplete, you're half right.) Vogel's has an iPad App called WallTimes. It's simple, useful, and well priced - at free. The App assumes you have purchased a minimum of three Wall Mounts, and that you have placed them in your Kitchen, Living Room, and Bedroom. As you move the iPad with you throughout your home environment, you are offered room specific utilities. 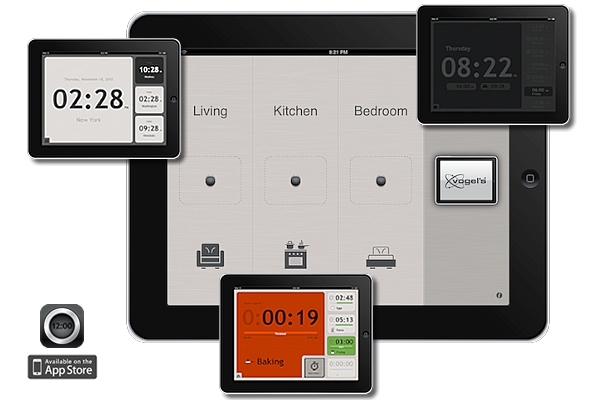 In the Kitchen you can access several customizable cooking timers. In the Living Room, four World-Time digital clocks are conveniently displayed on one screen. And in the Bedroom, a handy set of alarms customizable to each day of the week should you want to wake at different times on different days. In addition, the Bedroom utility dims to comfortable night viewing in dark rooms; or so they say as I haven't actually tried this. One other thing to note is that this app loves iPad battery juice. In less than an hour it took a 98% charge to 78%, with just the clock (Living Room) app running. Hopefully this is addressed in the near future; that or you're going to need an outlet nearby each Wall Mount. All in all, the App is well integrated to the eco-system Vogel's has created and does offer a reasonable impression of utility; and it's free. In total, Vogel's line represents a comprehensive universal mounting system that allows you to seamlessly take the iPad from room-to-room-to-vehicle-to-real world. Soon available from Apple Authorized Retailers at the following prices: Starter Pack (Holder & Wall Mount) $60, Additional Wall Mount $30, Car Mount $60, Flex Mount $60, Table Stand $20, Flip Stand $20, Adhesive Mount $30. Pros: A truly comprehensive system, minimalistic design is brilliant, build quality is high, the system employs continuity and consistency making a useful eco-system that is friendly and convenient, Free App extends the usefulness of the ecosystem, and the car mount is awesome! Cons: The eco-system works well with many mounts, which becomes very expensive very quickly, the Table Stand is rubbish, single point wall mounts may tend to spin over time - or back out the mounting screw, the Holder is heavy, thick and slippery, and the Free App eats the battery like it was December 21st, 2012. It is inspiring to see a company create a truly comprehensive system for the iPad. I would modify the Holder recommending a design that wasn't as curved or as slippery (for better gripping of the iPad Holder). I'd trash the Table Stand, and completely redesign it to truly fit into the eco-system, while also allowing for table typing. Lastly, the pricing scheme needs some work. The wall mounts are a minimum $10 too high and, as a system, the price climbs quickly. In the end, you have more options with Vogel's system than you do with any other case or stand. You can grow with it, expand it, and make better use of it over time. And the software has the potential to get better adding even more utility over the life of the products. Vogel's offers a compelling system that should be seriously evaluated. The system will please iPad, iPad 2, and Galaxy Tab owners. Check this system out at http://www.tabletonthewall.com/usa. Eric Juillerat is a technologist, geek, and all around admirer of anything with silicon, buttons, or touch screens.